Growing closely held or family companies, CEO's, mentors, networking...fuel for your success. All mankind is divided into three classes: those that are immovable, those that are movable, and those that move. Start-ups, new ventures, CEO's, mentors, networking, fuel for your success. Events, newsletter, tips, articles, jobs...FREE! The Lavin Entrepreneurship Center is proud to announce the election of Professor Alex F. DeNoble, the Executive Director of the Center, to the board of the United States Association for Small Business and Entrepreneurship (USASBE)! USASBE is the largest professional and academic organization in North America dedicated to entrepreneurship. It unites universities, business schools, non-profit organizations, for-profit companies and the public sector to create a mutually beneficial business network. Each year, USASBE holds conferences in selected cities across the US to provide a global network to support and encourage business development through the entrepreneurial research and education. This year, Dr. Michael Cunningham, Dean of the College of Business, and Jenny Amaraneni, the CEO and co-founder of SOLO Eyewear, were recognized by San Diego Magazine in their special feature on 50 People to Watch in 2013. The Lavin Center congratulates Jenny and Dean Cunningham for being chosen for their significant accomplishments that led to the honor to be among fifty the most influential San Diegans worth watching in the upcoming year! Dr. Cunningham became Dean of the College of Business at San Diego State University (SDSU) in 2011. He earned his Bachelor's degree in marketing and business management, Master's degree in graphic communications and his Ph.D. in administration, leadership and technology. Prior to becoming dean, he was a successful entrepreneur and founder of Cunningham Graphics International. Dean Cunningham is known for developing the financial literacy laboratory in conjunction with Wells Fargo, driving the naming of the Lavin Entrepreneurship Center and bringing in the toastmasters degree available to all business students on campus. 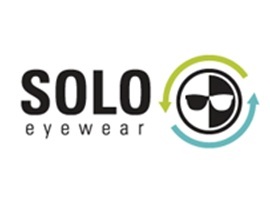 Jenny Amaraneni founded SOLO Eyewear with two other SDSU Business school graduates in 2011. They started this venture with a $1,000 loan and the passion for improving the vision of people the world over. Since launching, the company has provided over 2,400 cataract surgeries to those in need based on eyeglass purchases. Recently, most SDSU students went home to family and friends during the winter break. Not sixteen undergraduate students who travelled all the way to Barcelona, Spain to take a Fundamentals of Entrepreneurship course led by Bernhard Schroeder, Director of Lavin Center Programs. 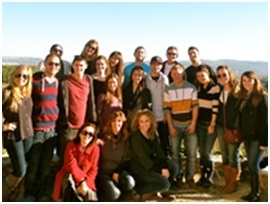 This intensive 3-credit course was taught over a three week period (December 27th to January 15th, 2013) near the University of Barcelona campus. Housed in the downtown Barcelona area, students utilized the public transportation system, local markets and street vendors to really see life on an everyday basis for most Spanish natives. In addition, the students met with and interviewed four local entrepreneurs who included a French restaurant, local tour company, cooking school and a Montserrat winery. This course was made possible through collaboration with the College of Business, College of Extended Studies, Office of International Programs and the Lavin Entrepreneurship Center. 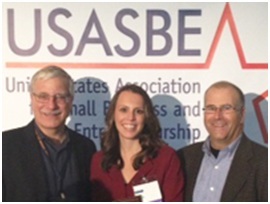 Erin Chmelik and Martina Musteen were awarded the Best Paper in Social Entrepreneurship at the 2013 USASBE Conference on January 12. Erin, a MBA graduate from SDSU, co-authored her work "Measures of Performance in the Context of International Social Enterprise" with Dr. Martina Musteen, a Management professor in SDSU's College of Business Administration. Erin's main research was focused on typologies of international social ventures and their measurement techniques in current business literature. Erin Chmelik obtained her Bachelor's degree in journalism and mass communications, and has recently earned her MBA degree with emphasis on International Business. Currently, Erin is residing in Denver, Colorado, and looking for exciting international development or social entrepreneurship opportunities. Dr. Martina Musteen earned her Ph.D. from University of Kansas and is currently an Associate Professor at San Diego State University College of Business Administration. Her research interests include internalization process of entrepreneurial firms, offshoring, foreign modes of entry, social entrepreneurship and corporate reputation. Dr. Musteen is an active member of the Academy of Management, Academy of International Business and Strategic Management Society. At SDSU, she is one of the active scholars engaged in the International Social Entrepreneurship Initiative (ISEI). The Zahn Center for Technological Innovation at SDSU'S College of Engineering has been working closely with the College of Business and the Lavin Entrepreneurship Center to provide mentorship to graduate and undergraduate students working on start-up endeavors. This semester, Dr.John Francis, a Management professor at SDSU, will be advising student teams residing in the incubator for the duration of the Spring 2013 semester. He will provide leadership in market research, business model viability and marketing strategies. Dr. John Francis is an Associate Professor of Management for the College of Business. 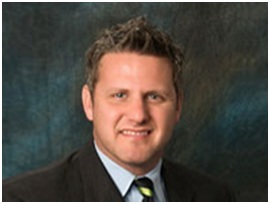 He possesses Bachelor's and Master's degrees in Business Administration from the University of Montevallo and Samford University, and a Ph.D. from the University of Memphis. His areas of expertise include business policy, international management and entrepreneurship. Dr. Francis focuses on turnaround strategies for declining firms, acquisitions, start-ups, international mergers and foreign market entry strategies. The Lavin Entrepreneurship Center at San Diego State University serves SDSU students, entrepreneurs and business leaders through entrepreneurial curriculum, workshops, internships, resources and events. For information browse the Programs section of our website, subscribe to the Lavin Center Calendar and sign up for the Center's Entrepreneurial Fuel Newsletter. Entrepreneur resources such as the Lavin Center resume guide, marketing and business planning tools and more can be found in the Resources section of our site. Note: Documents in Portable Document Format (PDF) require Adobe Acrobat Reader 5.0 or higher to view; download Adobe Acrobat Reader. Documents in MS Word (DOC) format require a Microsoft Word compatible viewer to view; download Microsoft Word Viewer.